Asian Games 2018 : India’s Jinson Johnson won the gold medal in the men’s 1500m event in the Asian Games 2018 in Jakarta, Indonesia. Manjit Singh, 800m champion, finished at fourth. Indian won the Gold medal in Women's 4X400 meter event. Asian Games 2018: The Indian quartet of Hima Das, Raju Poovamma, Saritaben Laxmanbhai Gayakwad, and Vismaya Koroth won the gold medal in women's 4X400 meter event. registered a time of 3 minutes and 28.72 seconds to finish at the top. While, India won the silver medal in the men's 4X400 meter event. 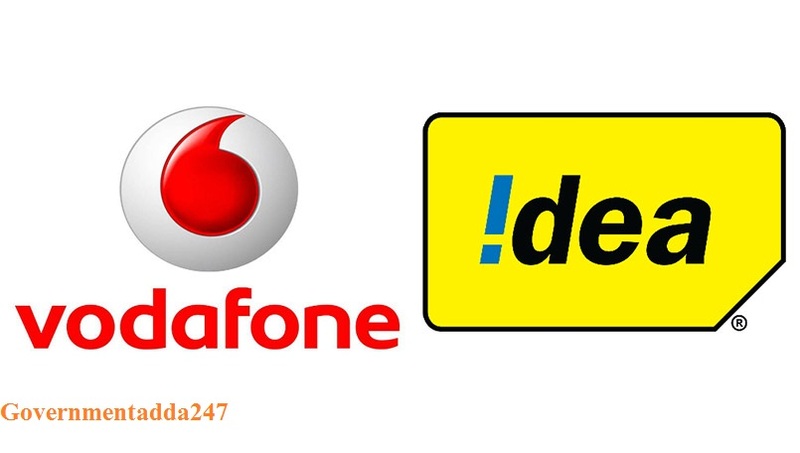 Idea Cellular Ltd announced that it has completed its merger with Vodafone India Ltd and Vodafone Mobile Services Ltd after getting approval from the NCLT (National Company Law Tribunal). Balesh Sharma takes over as Vodafone Idea's first CEO. He was the Chief Operating Officer of Vodafone India and a member of its executive committee. 6th RCEP Trade Ministers’ Meeting has begun in Singapore. Union Minister of Commerce& Industry and Civil Aviation, Suresh Prabhu, is leading the Indian delegation for the Trade Ministers’ Meeting. The Asian Development Bank (ADB) and The Government of India signed a $346 million loan for improvement of over 400 kilometers of state highways in Karnataka. Which will enhance connectivity and access to economic centers in Karnataka. Key Points ADB is a regional development Bank established in 1966. Headquarters of ADB : Manila, Philippines. The human resource development (HRD) ministry launched the Atal Ranking of Institutions to promote a culture of innovation and research in higher education, on Innovation Achievements (ARRIA). Key Points :Union minister Prakash Javadekar. Akshay Kumar starring Gold(Movie) becomes the first Bollywood film to release in Saudi Arabia. Gold is the fictional re-telling of India’s iconic win at the 1948 London Olympics. 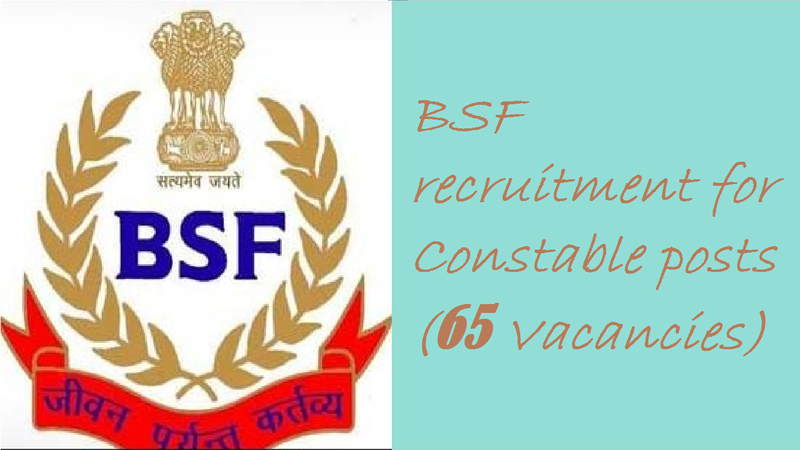 BSF recruitment for 65 Constable posts. Border security Force has released the notification for the recruitment of of the constable posts. 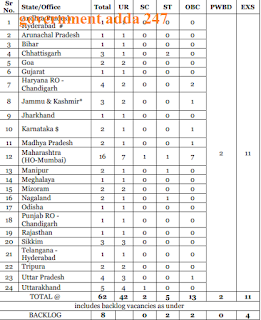 There are total 65 vacancies of the constable posts. Eligible candidates can apply for the posts from 30 September 2018. Before applying for the post candidates must fulfill the criteria for applying. The application are inviting for the 3 posts i.e. Constable (Generator Mechanic) 30 vaccant posts, Constable (Lineman) 12 vacant posts, Constable(General Operator) 23 posts. Candidates one who wants to become an army officer have an great opportunity to grabe it. T hoes who fulfill the criteria for this post can apply for this posts. The application are inviting from the date of publication of advertisement to the 30 September 2018. 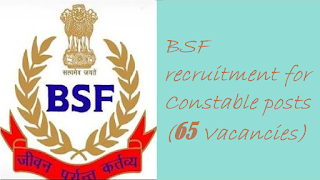 For more details see the information given below and download the Advertisement released by the BSF. आयु सीमा : कांस्टेबल पद के लिये छात्र न्यूनतम: 18 साल, अधिकतम: 25 वर्ष, यानी एक उम्मीदवार का जन्म 02.08.1993 से पहले नहीं हुआ होणा चाहिये और 01.08.2000 से अधिक नहीं (दोनों तिथियां सम्मिलित). ऊपरी आयु सीमा अनुसूचित जाति / अनुसूचित जनजाति 5 साल, अन्य पिछड़ा वर्ग 3 साल, विकलांगों को 10 साल, पूर्व सैनिक को 5 साल. शैक्षणिक अहर्ता : आवेदक किसीभी मान्यता प्राप्त संस्थान से आईटीआई के साथ 10 वीं कक्षा पास. If this article is useful for you then share it with you friends or the one who need it the most. 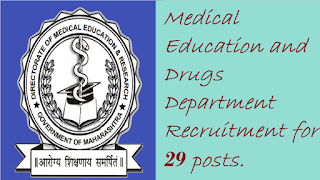 Medical Education and Drugs Department Recruitment 2018 for 29 posts. 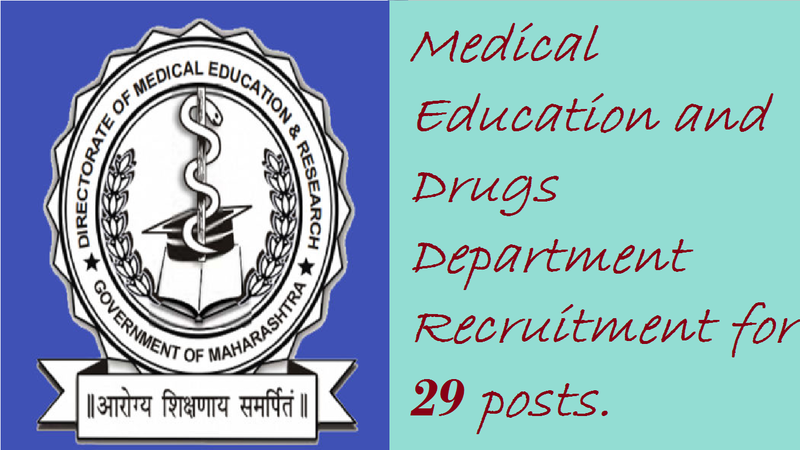 Medical Education and Drugs Department Recruitment for 29 posts. Medical Education and Drugs Department Recruitment, Medical Education and Drugs Department Bharti 2018 For 29 Associate Professor (Group A) Posts. Medical Education and Drugs Department (MEDD) released the notification for the recruitment of various 29 vacant post as per the advertisement number 02/2018. They are basically recruiting for 4 posts i.e. Medicine 13, Surgery 05, Pediatrics 03, Orthopedics 08. Eligible candidates can apply for this post on https://maharecruitment.mahaonline.gov.in/MR/MahaRecruitmentHome.aspx official website of Maharashtra recruitment portal. The candidate must be post graduate in M.D./M.S. having an experience of minimum 5 years only can apply for this posts. The pay scale for this post is Rs.37400/- to 67000/-. 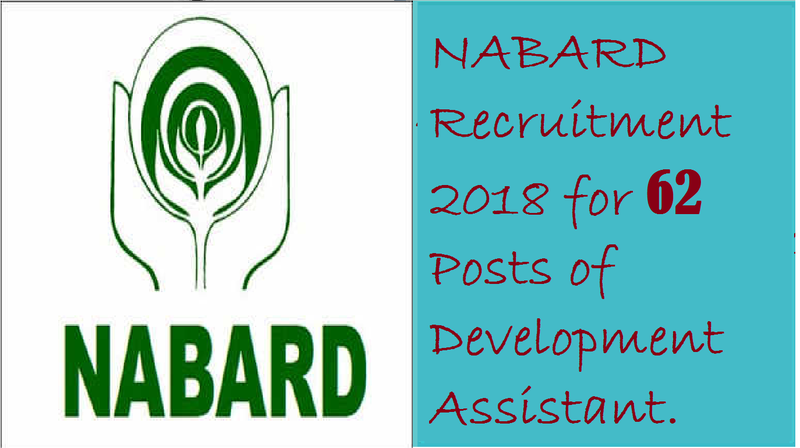 The applications are inviting from the eligible candidates from 30 August 2018 and the last date to fill the application form is 10 september 2018. शैक्षणिक अहर्ता : संबंधित विषय मे पोस्ट ग्रजुअशन इन M.D./ DNB और 5 साल का अनुभव. Process To Fill Application Form. You should have to fill the form and upload the all recquired document, make sure all the information filled by you is correct and apprpriate do not use inappropriate information to fill the form this may result bad when you go through the document verification process. Fill the form with all information and upload the scanned document and Fill the education related all information. Once you fill the all information and after completion of payment you have to submit the application form by clicking on submit button. After sortlisting the candidates the Medical Education and Drugs Department will call the sortlisted candidates and all the candidates will have to go through document verification process. Once the document verification process done Medical Education and Drugs Department will sortlist the candidates and call them for interview process and will coduct the interview and the interview result will be announced on the official website of the Medical Education and Drugs Department or visit our website for the result. 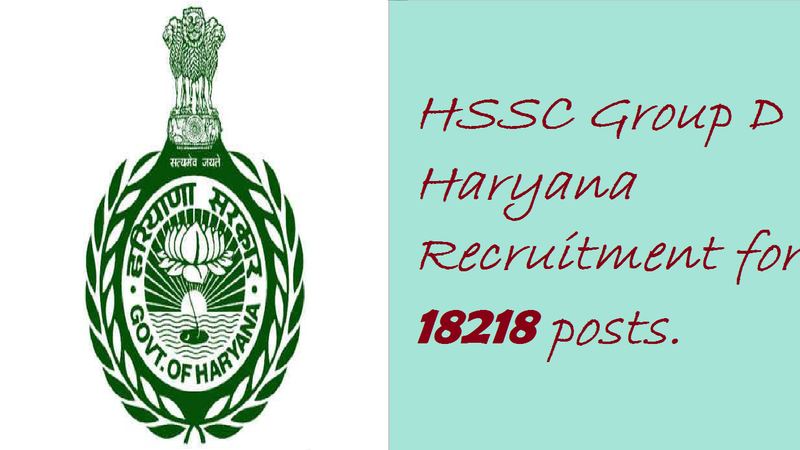 HSSC Group D Haryana Recruitment for 18218 posts. The Haryana Staff Selection Commission (HSSC) has released notification for total 18,128 Group D posts on 26th August. The last date to apply is 18 September 2018, and the last date to file applications 21 September 2018. HSSC is holding the recruitment drive to fill the total 116 types of positions for 74 different departments and agencies, to know detail about the posts checkout the notification which is released by HSSC, Minimum Requirement Candidates must have passed Class 10 from a recognised board with the Hindi or Sanskrit as one of the subjects.Candidate must be between 18 and 42. To real the full advertisement checkout the notification link which is given below. आयु सीमा : न्यूनतम: 18 साल, अधिकतम: 42 वर्ष, यानी एक उम्मीदवार का जन्म 1-08-1976 से पहले नहीं हुआ होणा चाहिये और 1-08-2000 से अधिक नहीं (दोनों तिथियां सम्मिलित). ऊपरी आयु सीमा विकलांगों को 10 साल, पूर्व सैनिक को 10 साल. HSSC Group D Vacancy 2018 Selection procedure of Haryana recruitment will be concluded in the two phases as follows. The HSSC Group D Written Examination will be taken for 100 marks. The one who Scores well in this examination will get selected for the HSSC Group D vacancies. Marks will be allotted to candidates based on their Experience and Socio-Economic Status. These special categories for marks allotment are enlisted below. Candidates will be allotted 0.5 marks for each year of experience in the same or higher post than which they are applying for in any Department of the Government of Haryana. Maximum marks allotted will be 8 marks. If the candidate belongs to a denotified tribe or a nomadic Tribe of the State f Haryana they will be allotted 5 marks. If the applicant is a widow or if the applicant lost their father before attaining the age of 42 or if the applicant lost their father before he or she attained the age of 15 then the candidate will be awarded 5 marks. If no person amongst the candidate’s father/mother has worked n the Haryana Govt, the candidate will be allotted 5 marks. Ensure you read every one of the directions deliberately before you begin filling the application. You can begin filling the application frame precisely without committing any errors. When you have presented the application shape you will get the Registration id and secret key. You should note down this secret key and spare it as you will require it later on. You can remove a print from your finished application frame and secret key and enlistment id. After you have finished the application shape filling process you can proceed onward to present your HSSC Group D opening Application charge. Applicants can pay the expense online by net managing an account/Mastercard/check card, or disconnected through money challan from State bank of India, Punjab National Bank or IDBI Bank as portrayed on the Official site. For more data with respect to the application process wear' neglect to visit the official site of HSC which is hssc.gov.in. You can likewise look at the official Notification pdf connected beneath. For any Guidance, data, elucidation, with respect to the HSSC Group, D 2018 Application Form filling process hopefuls can approach the accompanying number on all working days between 9 am and 5 pm. 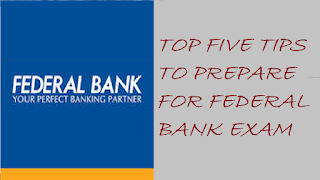 Five Ways To Learn How To Crack Federal Bank Po And Clerk Exam In Just 10 Days Tips And Tricks Effectively. 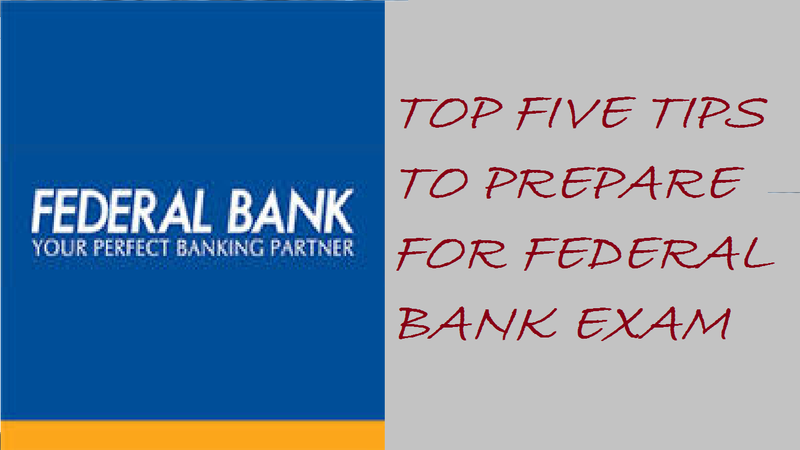 Tips for How to prepare for Federal Bank Exam. 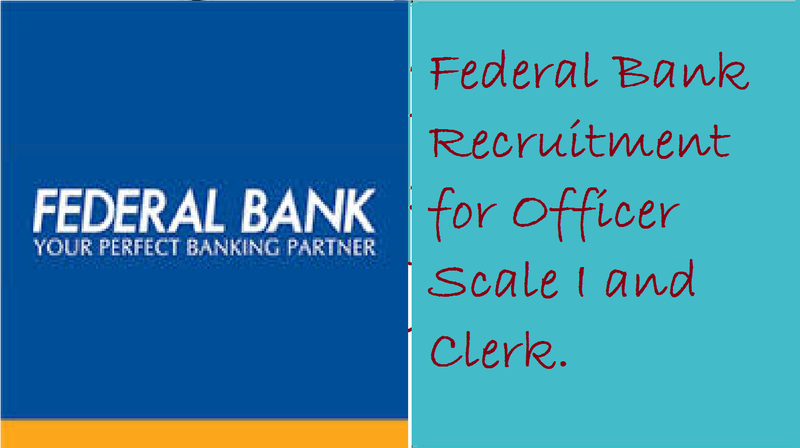 The Federal Bank Exam for Probationary Officers (PO) and Clerk is set to happen on ninth September 2018. You should make a decent attempt to cover the syllabus for Federal Bank Exam and set aside out opportunity to reconsider the Syllabus. The brilliant work will be the way to set up all segments appropriately. follow this article to plan for Federal Bank PO and Clerk Examination and get extra ordinary tips, online investigation material, tests and bunches of master bits of knowledge on the planning strategy. The more you go through the online material will help you a lot. 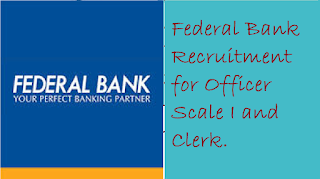 Do follow following tips to get qualify in Federal bank exam. Points in which you are normal and require more practice. Points which you know exceptionally well and you are great at. Points in which you are poor and need to create distinctive methodologies for. Subsequent to taking note of down these things, you can without much of a stretch make sense of: Points you have to give more consideration regarding. How much time you need to apportion for considering and practice every day. In light of your investigation set up an appropriate Study Schedule for yourself. Subsequent to setting up the examination plan, confer yourself to tail it entirely. Set up a Study Plan in light of the Exam Pattern, Syllabus, Time left for the exam and spotlight on your change. It is vital to keep up normal examinations and stay predictable. Assign time for honing Online Tests which will help you a ton in scoring admirably in the exams. 4. Try to solve the Mock test. Endeavor no less than one Online Mock Test day by day in view of what you contemplated that day and dissect your outcomes. This will assist you in checking whether you have comprehended what you consider. The more you practice will build your confidence, do not repeat the same mistake every time while solving the question. Try to be more patient while solving a mock test and give your best. While solving mock test you will find which section of your is weak try to practice that section more and more. When you completed the entire syllabus at that point begin endeavor the section astute and full-length Mock Tests. Discover where you stalled out, where you invest more energy, where you committed senseless errors, what you can do to enhance your score. Do whatever it takes not to rehash them in next test. In the underlying stage, on the off chance that you get fewer checks at that point don't get baffled. With time and relentless investigation and practice, you will make strides. Reconsider all your syllabus subjects before few days indeed and concentrate more on the feeble area around then. Additionally, you should hone increasingly to have the capacity to settle all inquiries in great planning. A large portion of the understudies make this inquiry that How much time is required to get ready for an exam? The appropriate response is as you deal with your investigations. Practice as much as you can don't sit around idly in simply considering the exam. Fathom earlier year inquiries and more practice can without much of a stretch spare your opportunity in the real exam. Government Adda 247 provides you all the important current affairs of 28-29 Aug 2018 which almost have an unique important updates of the daily events which happened in nation wide and world wide from all the news paper such as The Hindu, Times of India, PIB, The economic Times, Indian Express, Business Standard, and all the government authorized websites. This important current affairs will help you in various competitive exams to score more marks in Banking, SSC, UPSC, Railways and all other states exams. The National Sports Day in India is celebrated on 29 August each year. This day marks the birthday of Major Dhyan Chand Singh, the hockey player who won gold medals in Olympics for India in the years 1928, 1932 and 1936. India’s first manned space flight called as "Gaganyaan"
India’s first manned space flight called as "Gaganyaan" will send three human beings into space for five to seven days and the spacecraft will be placed in a low earth orbit of 300-400 km from the earth’s surface. India's 28-year-old sprinter Manjit Singh won the gold medal in the 800m men's event at the 2018 Asian Games, this is the ninth gold for the country. The Center, World Bank, and state-owned EESL inked a $220 million loan agreement and $80 million guarantee pact to push energy efficiency programme in India. SAARC Agri Cooperative Business Forum began in Kathmandu, Nepal. The First South Asian Association for Regional Cooperation (SAARC) Agri Cooperative Business Forum began in Kathmandu, Nepal. The theme of the three-day Forum is the 'Organizing and Strengthening Family Farmers’. To improving the performance of its electricity distribution sector in Rajasthan the World Bank will provide a $250 million loan facility, the Union Finance Ministry said on Tuesday. An agreement was signed here among the Government of India, the Government of Rajasthan and the World Bank. 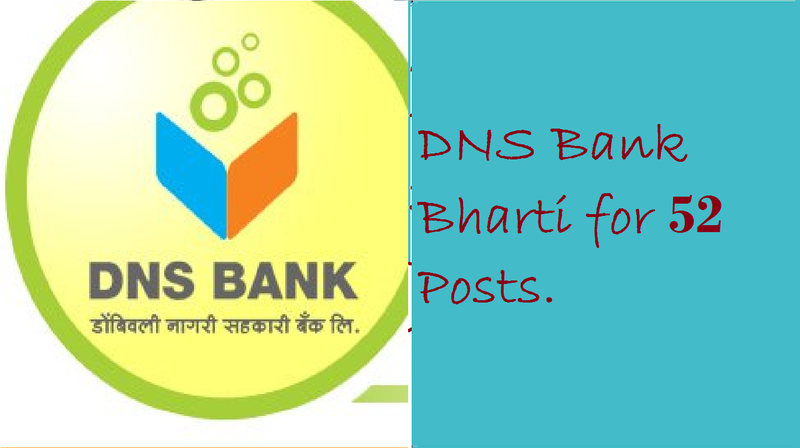 DNS Bank Bharti for 52 Posts. Dombiwali Nagari Sahakari Bank has released the notification for recruitment of Assistant Manager post. The application is invinting for the total 52 vacancies. Eligible candidates can apply for this for, to check the eligibility criteria check the information given below. This is the great opportunity for those students who are preparing for banking exam and wants to become a banker. Any eligible candidate, who aspires to join the Bank as Assistant Manager, is required to register for the Online Written Examination. Candidates who appear and are shortlisted in the examination will subsequently be called for a Personal Interview and on being short-listed in Interview, will have to appear for Medical Fitness Test to be conducted and coordinated by DNS Bank. Punishment for Wrong Answers: There will be punishment for wrong answers set apart in the Objective Tests. For each question for which a wrong answer has been given by the applicant one fourth or 0.25 of the imprints doled out to that question will be deducted as punishment to touch base at the amended score. On the off chance that an inquiry is left clear, i.e. no answer is set apart by the applicant, there will be no punishment for that inquiry. Thank you for reading the article, If you like this article please share with your friends who need it the most. 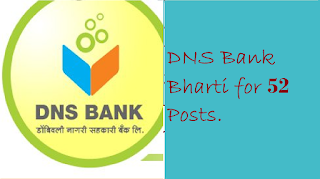 Check out this link DNS Bank Bharti for 52 Posts. The Minister of Petroleum and Natural Gas & Skill Development & Entrepreneurship Launched an online portal for enabling efficient, easy and transparent booking of common carrier capacity for natural gas transmission services under GAIL's pipeline. The portal is a transparent, market-friendly component in the gas trading system. The Defence Acquisition Council (DAC) on Saturday has approved procurement worth Rs. 46,000 crore for the purchase of defence equipments and supplies, including 14 Vertically Launched Short Range Missile, 111 utility helicopters, 150 indigenously developed 155 mm Advanced Towed Artillery Gun Systems. Chief of Army Staff: General Bipin Rawat. 8th India – Kenya Joint Trade Committee meeting was held in Nairobi, Kenya from August 22-25, the meeting was co-chaired by union commerce and industry minister Suresh Prabhu and Mr Peter Munya, Cabinet Secretary for Industry, Government of Kenya. Leading global investment bank "oldman Sachs" and one of the active investors in India, announced the appointment of Prachi Mishra as a managing director and chief India economist. North Korea has been announced that North Korea would be the host for the 2019 Asian Youth and Junior Weightlifting Championships which will commence from October 27, 2019. Key PointsCapital: Pyongyang.Currency: North Korean won. 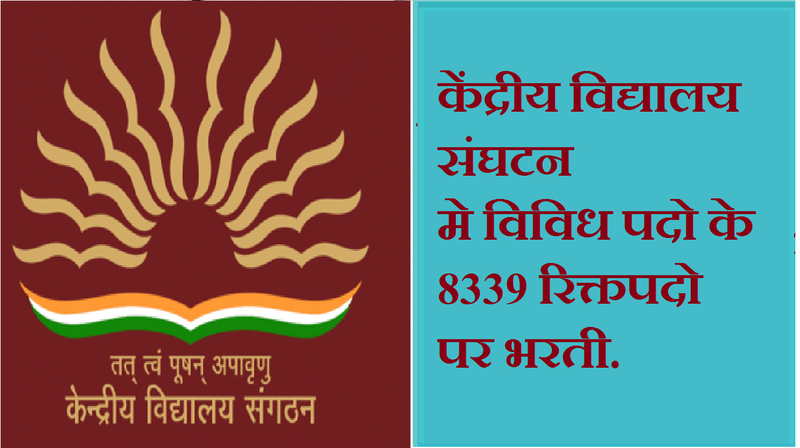 [KVS Recruitment] केंद्रीय विद्यालय संघटन मे विविध पदो के 8339 रिक्तपदो पर भरती. KENDRIYA VIDYALAYA SANGHATAN(KVS) RECRUITMENT 2018 FOR TEACHING AND NON-TEACHING POSTS. केंद्रीय विद्यालय संघटन मे विविध पदो के 8339 रिक्तपदो पर भरती. 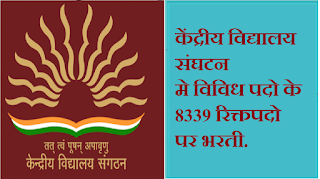 KENDRIYA VIDYALAYA SANGHATAN(KVS) released the notification for the recruitment of various post eligible candidates can apply for this posts. The vacancies that released is for PRINCIPAL (Group-A), VICE-PRINCIPAL (Group-A), POST GRADUATE Teachers (PGTs) (Group-B), TRAINED GRADUATE Teachers (TGTs)(Group-B), LIBRARIAN (Group -B), PRIMARY TEACHER (Group-B), PRIMARY TEACHER (MUSIC) (Group-B).The total vacancies are 8339, this is the big opportunity for those students who are preparing for competitive exams. The last date for online submission of application form is 13 September 2018. Read the full article for further information. 5 बैचलर ऑफ साइंस या डिग्री के साथ लाइब्रेरी साइंस डिप्लोमा. i. Candidates are required to apply Online through Kendriya Vidyalaya Sangathan website at www.kvsangathan.nic.in. No other means/mode of application will be accepted. ii. Candidates are required to have a valid personal email ID and mobile number. Under no circumstances, he/she should share/ mention email ID to/ or of any other person. It should be kept active during the currency of this recruitment. All the eligible candidates are informed by e-mail or through SMS regarding downloading of Admit Card from designated webportal. iii. In case a candidate does not have a valid personal email ID, he/she should create his/ her new email ID before applying Online. per instructions contained in the online application format and submit the same online. v. Fee once deposited the same shall not be refunded under any circumstances. 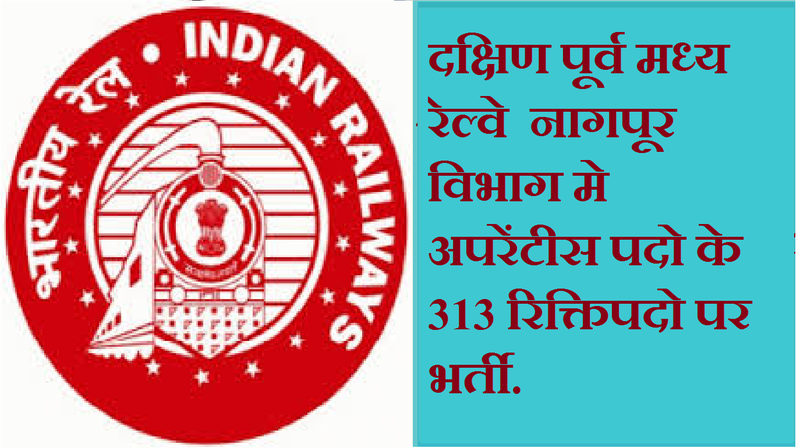 SECR - South East Central Railway Nagpur Bharti 2018 for 313 posts. दक्षिण पूर्व मध्य रेल्वे नागपूर विभाग मे अपरेंटीस पदो के 313 रिक्तिपदो पर भर्ती. 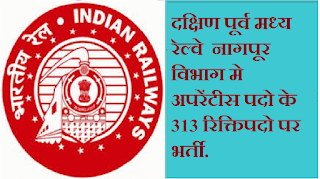 South East Central Railway, nagpur released the notification for the recruitment of various post eligible candidates can apply for this posts. The vacancies that released is for nagpur main devision and motibagh. the total vacancies are 313, this is the big apportunity for thoes students who are preparing for compitative exams. The last date for online submission of application form is 15 september 2018. Read the full article for further information. 10 वीं पास परीक्षा या समकक्ष (10 + 2 परीक्षा प्रणाली के तहत) न्यूनतम 50% अंकों के साथ और एनसीवीटी द्वारा अधिसूचित व्यापार में राष्ट्रीय व्यापार प्रमाण.